One thing about living on this Island...one meets interesting people and sees interesting things. Nature is amazing and we are fortunate to be able to experience it here. In the last few years, I have been observing and learning about the birds who use the Island whether it be as their habitat throughout the season or as a stopover on a migratory path. So, I am excited to post about Birds today and the 8th Annual Door Islands Bird Festival set for May 30-June 1. 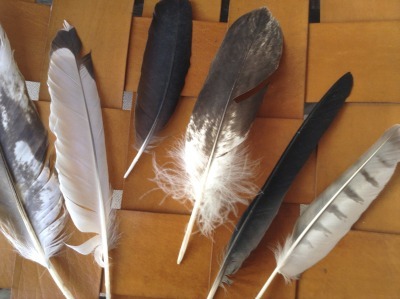 I found these feathers over the course of this past year on my walks...funny how objects present themselves and then come to light in a different way...The Cornell Lab of Ornithology has posted an interactive guide/source in March which I found helpful. This Winter, this trio hung out at Ranger Randy's window here on the Island. Although we may not have had the Red Cup as Winter crept on, we still had characters ... of a sort. The focus this year I believe will be the resurgence of the eagle population...such amazing creatures...young eagle photo by Susan Ulm. Peninsula Pulse 4/17/14 ... taken near Bailey's Harbor. I could go on and on about the growth in the population since the 1960s ... but then I have in other posts! 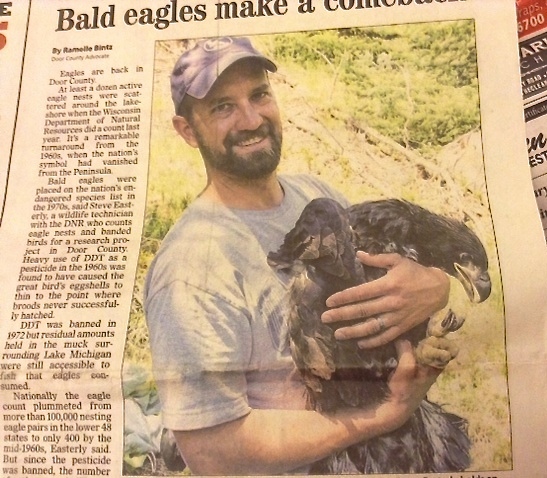 Eaglet ... 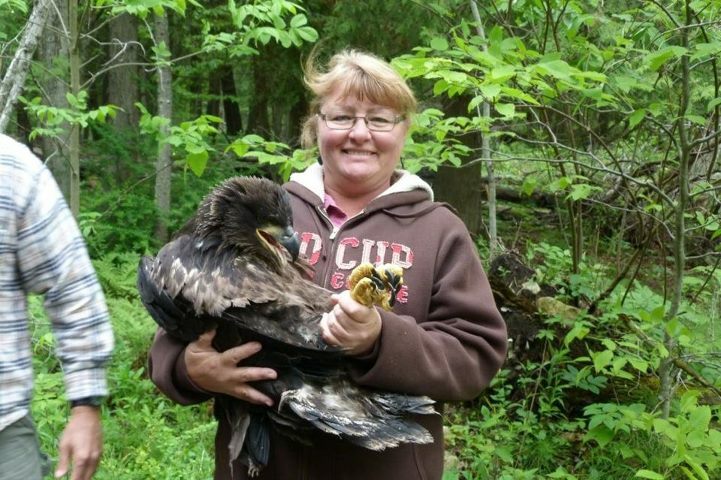 US Fish and Wildlife Services Photo...interested in learning more about eagles, osprey? ... take part in a walk with able experienced volunteers? Click this link to the Door Islands Bird Festival site for more information. As I move about, I now notice so much more about these creatures...NPR had an interesting piece recently on "Divorce Rate for Birds" ... read it here to figure out the Island connection(s) ... illustration: Robert Krulwich/NPR... based on Noah Strycker's latest book, The Thing With Feathers. Veteran's Remembrance...it's more than just one day. October 19th was a special day for Island resident Melody Walsh. Perhaps even more so for her Dad, Ivan Wartzok, a Navy veteran who served in Africa during the Korean conflict. On that Saturday, Melody's Dad was one of 88 veterans who took part in the 13th Badger Honor Flight. Melody was able to serve as her Dad's guardian. The trip started with a stop at the Tomb of the Unknown Soldier at Arlington National Cemetery. 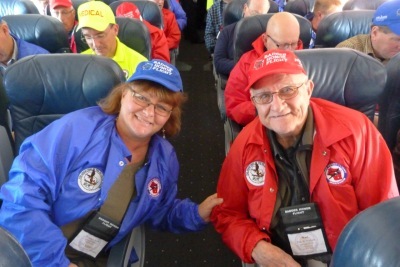 Honor Flight has bases throughout the U. S., with the Badger division originating out of Madison. (There are several bases in WI alone with Appleton/ Old Glory flights perhaps the closest to the Island.) The Ho Chunk Nation is one of the corporate sponsors for Badger flights. The veterans were flown to D.C. to visit the monuments built to honor their service. Meals and snacks as well as all ground transportation and any and all health and safety support were complimentary, with guardians paying their own way. Ivan's brother-in-law who served on the frontlines during the Korean conflict, was able to be on the same flight with his nephew as his guardian. The group photo was taken at the Marine Corps Memorial Iwo Jima Statue. This stop had special significance for Ivan as he knew and fished with one of the men depicted in the bronze monument. Inscription at the Korean War Veterans Memorial...we owe so much to the men and women who have served and protected us. It was a long day...at the airport by 5am...returning about 10:30pm...a memorable one. Upon his return, Ivan and his teammates were greeted by over 6,000 grateful citizens at Dane County Airport. The Island Ceremony is at 10:30 am on Monday...participation of Island students and the traditional patriotic sing-along continues to be part of this event...To go on an Honor Flight: Contact an Island American Legion Member... there are applications here on the Island or visit The Honor Flight Network at the link below. Birds... I can hear them now when I wake up. Saturday, somewhat warmer, started at the TPAC... with the clearing out or waking up of the gardens. Longtime TPAC Garden supporter Jerry Landwehr came...everytime I help I learn something new from this man. What really told me Jerry had experience was his "kneeler"... photo doesn't do it justice! Lots of folks came and it made the task easier ...and fun. Melody Walsh came by. Melody has a wealth of knowledge re birds and she wanted us to see a kettle of migrating Broad-winged Hawks. Birding is new to me and I had trouble counting them...hundreds I would guess, letting the air currents help them travel. It will be interesting to see what birds appear this year. Last year, Melody photographed this Barn Swallow at Kap's Marina. (That was where she first sighted the Broad-winged Hawks on Saturday.) She found an Indigo Bunting... last year on Rock Island... and the Canada Warbler stayed around all Summer. Migration is indeed apparent and that is part of the reason the Island wil be the base for the 7th Door Islands Bird Festival, May 31st to June 2nd. As I started to study up on this pastime to publicize the event I found this resource on Migration Info ... it has timely information on the topic. Since this year has been slower to warm up, there is a good chance different migrating birds will be seen than last year. Mel found this White-throated Sparrow at her feeder this past week. 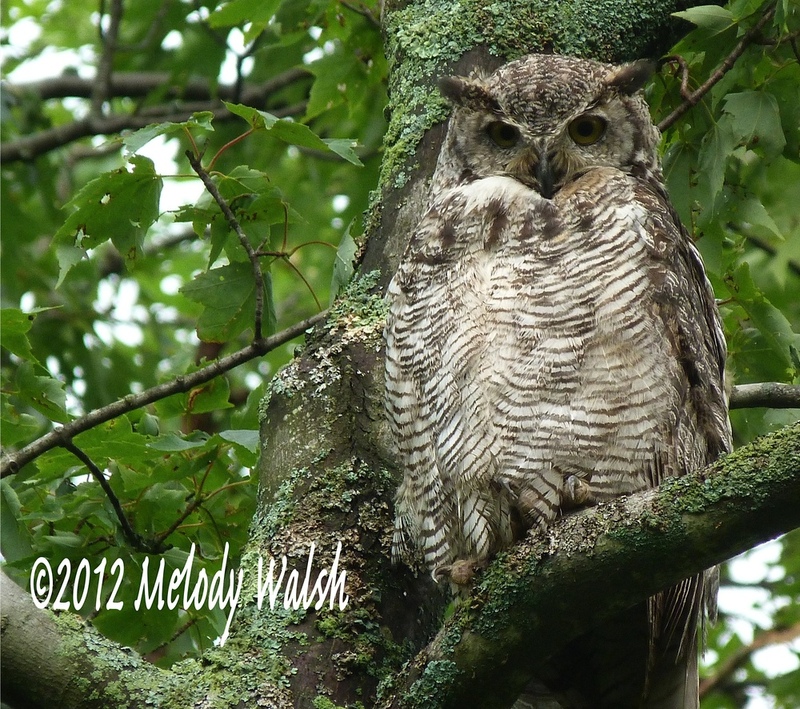 Also observed ... a Great Horned Owl...no telling what birds will be visiting...a complete list of activities can be found on the website. I do know that Melody will be leading a walk on Rock Island Sunday morning, June 1st. In this past year, Yellow-billed cuckoo were observed on the Islands of Rock, Plum, and Washington. Throughout the season over 50 were counted. I love the polka dot tail...Mother Nature is amazing. For more information, check out the Bird Fest Site. Oh, ... I might add the Cottage will be open for the Season by then and that weekend is currently available! 3rd - Ferry Schedule moves to 4 trips a day! So, welcome to Winter - this is what all this preparation is about! Congratulations go out to the Island's Melody Walsh...another great photo...this time on the cover of this month's "Wisconsin Natural Resources" promoting that magazine's Great Lakes photo contest........her first cover photo! Melody took this photo on the East side of Rock Island State Park. She submitted this photo in 2010. The person in the photo is Erik Lucia President of the Friends of Rock Island State Park. The 2013 photo contest deadline is February 1, 2013. Consider entering! I will be happy to send on the details.